Color: Black with silver frame. Liquid crystal display (LCD) technology has been utilized since the 1970s in calculators, and in recent years has been used more and more in computer screens and television sets. In a nutshell, it works like this: cells full of light-polarizing liquid crystal trapped between two plates are made, by electrical charge, to rearrange the orientation of the crystals, allowing for different filtering of light going through the cells. This is why LCD televisions are thinner and lighter than the usual cathode ray tube (CRT) variety. LCD TV monitors have good picture quality and are very space-efficient, but are not without drawbacks. Displaying deep blacks is a problem, which persists even today, and the viewing angles are narrower than flat screen CRT or Plasma technology offer. Historically, the rate at which the picture refreshes has been slower for LCD TV sets than for CRT or Plasma can display. Pixelation/motion artifacts in larger LCD television screens can be a problem as they can be with competing technologies. Despite these drawbacks, recent years have seen great improvements in all aspects of LCD crystal and glass technology, and a decent-quality LCD screen will be a great alternative to its CRT or Plasma counterpart - especially in the smaller 13" to 26" range. Simply put, the from this LCD television picture is great. Several people saw the latest offerings from Toshiba in our showroom and all were impressed. We were drawn in immediately by the contrast and the clarity of the picture (the 32" screen had some noticeable pixelation/motion artifacts and appeared just slightly paler than the smaller screen. While the inevitable ghosting/motion lag (with LCD) occurred in fast action scenes, it was not terribly distracting and was only noticeable in the most frantic scene our Ultimate DVD (Unapix Ent.) could throw at it: a rodeo sequence designed specifically to test this property. As a test of fast-paced action a viewer is more likely to encounter, we tried the epic fight scene at the end of Kill Bill Vol. 1 (Miramax)-and almost forgot what we were looking for. At normal viewing distances from the screen (about 8' to 10') these drawbacks should be minimal. The color information these screens displayed was accurate, fantastically vibrant and did not lean to much to red in flesh tones. Viewers may want to tweak the factory settings. Our adjustments were: brightness-37 (easy on the eyes, makes for relaxing viewing); contrast - 50 (down from the factory setting of 80, which is much too high for a dimly lit viewing room); color - 58; tint - (-9) (on a scale of -50 to 50); sharpness - 27 (almost as a universal for televisions, a good sharpness setting will be very low). We watched a variety of scenes, and all of them were realistic. These sets do a nice job - displaying fairly dark blacks, which has always been a challenge for LCD technology -even today less expensive LCD monitors will display only a very dark gray. Again, the Toshiba LCD screens handled well, producing a black much darker than the average screen can. The listed contrast ratio is 500:1, which means that the brightest white light is 500 times more intense than the darkest black. This is high for LCD and allows the colors in between to stand out well. We were especially impressed with the clean differentiation of varying shades of color in a sequence called Desert Rock. Fire and explosions on our Ultimate DVD were very sharp, and rippling water looked real enough to swim in. These screens, The viewing angle problem that LCD technology has been known to have may be a thing especially the smaller, were a real pleasure to watch. The viewing angle problem that LCD technology has been known to have may be a thing of the past; certainly these two screens made us think so. Any conceivable arrangement of viewers should satisfy everybody involved. We were surprised to find out that the viewing angle was very close to 160º. We knew these sets were high-quality, but this still exceeded our expectations. And this wide angle viewing quality is testimony to the claims of some major LCD panel manufacturers that the quality of the glass and LCD crystal technology can have a drastic impact on quality viewing. Our comfort point for viewing was just over 8' away, approximately level with the screen. At 10W per speaker, the audio is very robust for such small TVs. The speakers provided a nice complement to the picture, allowing the user to hear full sound even without extra speakers. At one-third of the set's volume range, we heard everything that happened distinctly and pleasantly. The quality still holds strong at higher volumes. The picture size settings were: Natural, for 4:3 content, Theater Wide 1, which enlarges the edges more than the center and cuts off small parts of the top and bottom; Theater Wide 2, which enlarges with no distortion, but cuts off small parts of the top and bottom; Theater Wide 3, which enlarges the width disproportionately; and Full, which shows widescreen content in its originally intended format with no conversion. For a 4:3 picture, purists will prefer to use the Natural setting, and the rest will probably choose Theater Wide 2 for scaling to use the entire screen. The Toshiba LCD televisions are well designed and attractive, with a sleek and classy look. Some new televisions have an overdone space-age feel, but here the silver is balanced and appropriate. The glass overlay face is a nice touch. The dimensions of the LCD television sets are 32 ¼" x 18 3/8" x 5 ½" for the 26" unit, and 43 ½" x 21 ½" x 6 ½" for the 32" piece. The pedestal stand is 16 ½" wide x 12 ½" deep, and the bottom of the LCD sits about 4" from the table or stand surface. The speakers are 3 1/8" wide for the 26" unit and 4 ½" wide for the 32" set, and are almost the full height of the sets. With their picture sizes and physical dimensions, the 32" diagonal image is capable of occupying the main position in a small living room, while either size would also function well in a smaller environment such as a kitchen, bedroom, bathroom or a dentist office waiting room. The apartment/condo-dweller will appreciate the space economy of the sets and extremely updated look and feel. High quality picture, ample sound, and solid menu options characterize these Toshiba LCD TV offerings. They are versatile and manufactured for quality viewing. The manufacturer's suggested retail price (MSRP) of these sets are $3,299 for the 26" screen and $4,499 for the 32" screen. Even at the MSRP, but especially at the "street" price, these screens are a tremendous value. 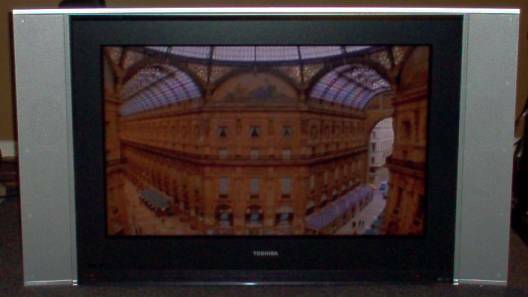 Toshiba is at the high end of television quality, and these are some of their best products.